Sale Sharks are interested in signing Castleford Tigers winger Denny Solomona, director of rugby Steve Diamond has confirmed. Tigers are taking legal action against the 23-year-old Samoan after he failed to report for pre-season training. He scored 42 tries in the 2016 season, including a record 40 in Super League. 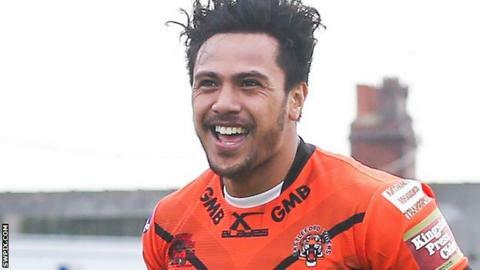 "Denny Solomona has resigned from playing rugby league and us, and many other clubs, are interested in signing him," Diamond told BBC Sport. "He's got a friendship with [Sale centre] Sam Tuitupou and he's been to have a look around and at this moment that is where we're at with it." Tigers chairman Steve Gill said in October that Solomona was not for sale. "There are no governing body registrations between the sports," added Diamond. "It is just like someone coming from another sport to rugby union, whether it be football or basketball and I don't understand what the furore is about." The Sale boss also addressed rumours they are interested in signing England and Bath fly-half George Ford for next season. There are reports Oldham-born Ford, 23, could leave the Recreation Ground at the end of the season. "We're not allowed to discuss or talk to players until January 1," added Diamond. "We need four or five players better than the ones we've got. We are looking for world-class players to join us for next season." When asked if a rumoured £600,000 wage for Ford, or any other international, would fit into Sale's wage structure next season, Diamond said the Sharks could afford to pay a player that amount.